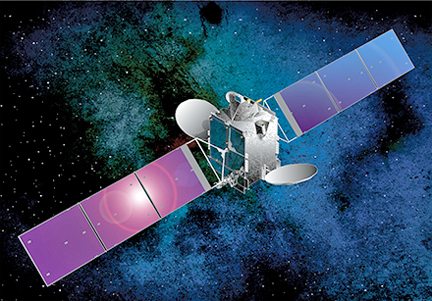 [SatNews] Space Systems/Loral (SSL) has announced that the Optus 10 satellite, designed and built for Optus, is successfully performing post-launch maneuvers according to plan. Artistic rendition of the Optus 10 satellite. Image is courtesy of SSL. The satellite deployed its solar arrays on schedule following its launch aboard an Ariane 5 launch vehicle from the European Spaceport in Kourou, French Guiana. The satellite will start maneuvering into geosynchronous orbit with the firing of its main thrusters. Optus 10 is designed to provide high quality consumer broadcast service and two way voice and data communications services for Australia and New Zealand. The satellite was built with the flexibility to augment the Optus fleet and assure the highest level of ongoing service where it is needed the most. Optus 10 will be positioned at 164 degrees East longitude. It has 24 Ku-band transponders and is based on the SSL 1300 platform, which provides the flexibility to support a broad range of applications and technology advances. The satellite is designed to provide service for 15 years or more. With this launch, there are 77 SSL-built GEO satellites currently on orbit.